Investing in Real Estate Investment Trusts (REITs) can provide dividend investors with high yields, steadily growing payouts, nice diversification, and an attractive income stream for retirement living. However, REITs have a number of complexities and risks that should be understood before making any investments. Before jumping into the essential information investors need to know about REITs to make better informed decisions, it is worth highlighting some of the sector’s appeal. This is understandable given that real estate has a several built-in advantages that naturally make it appreciate in value. For example, the growing global population generally leads to both economic growth and higher demand for land and properties involved in housing and industrial development. In addition, the ability to use leverage (i.e. buying real estate properties with debt, such as a mortgage) means that investors can generate substantial returns on investment. Furthermore, real estate is usually a predictable and cash-rich business thanks to rental income, which makes this kind of investment highly attractive to long-term investors. And finally, real estate owners enjoy numerous tax advantages, including the ability to deduct depreciation expenses from earnings and mortgage interest from taxable income. But for most retail investors, the idea of investing in real estate other than their own homes can be intimidating. After all, owning a rental property can be extremely hands on and time intensive. In addition, there are numerous legal implications and risks that becoming a landlord involves. Most people simply don’t have the time or desire to get involved with these matters. Fortunately, there is a much simpler way for long-term income investors to profit from real estate, one that is no more difficult than buying shares on a stock exchange. Real Estate Investment Trusts, or REITs, were created in 1960 as a new, tax efficient means of helping America fund the growth of its rapidly increasing demand for all types of real estate. Basically, REITs are pass-through equities in which the company pays no federal income tax as long as it pays out at least 90% of its taxable income as unqualified dividends to investors. The result is a naturally high-yielding class of equities with many REIT stocks sporting dividend yields in excess of 5%. Due to its high payout ratio, which leaves little retained cash flow, the REIT business model is predicated on constantly raising capital from the debt and equity markets in order for management to grow its portfolio of cash-producing properties; thus allowing dividend growth and share price appreciation over time. Over many decades, REITs have been one of the best long-term asset classes for investors to build income and wealth over time. 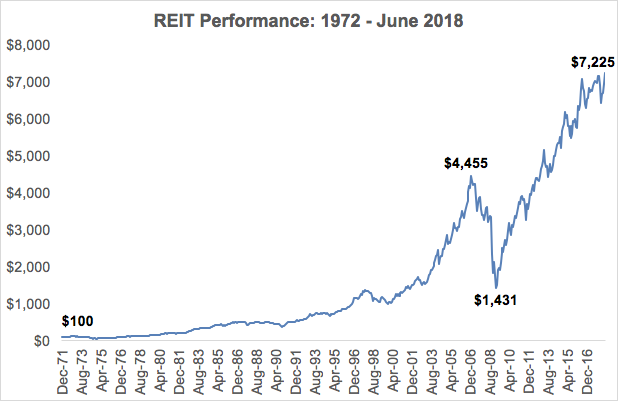 As you can see below, $100 invested across all REITs at the start of 1972 would have grown to more than $7,000 in 2018, representing compound annual growth of about 10%. "The main reason to own REITs isn't to improve your portfolio's return, though sometimes that will happen. The bigger reason is to reduce volatility, increase diversification and provide a source of income." And REITs have certainly done just that over the years. In about one out of eveyr four calendar years since 1975, REITs' returns varied by at least 25 percentage points from those of the S&P 500 Index, according to MarketWatch. In most of those years, REITs earned a higher return. Furthermore, per Andrew Rubin, a portfolio manager at Fidelity, the growth rate of REIT dividends has outpaced inflation in 18 of the last 20 years, demonstrating their inflation-hedging qualities. The REIT industry's solid long-term performance and diversification benefits have resulted in it growing over the decades to more than $1 trillion in market capitalization and holding over $2 trillion in total assets. The industry has grown so large, in fact, that in 2016 Standard & Poor's adjusted its Global Industry Classification Standard system to make REITs their own sector (Real Estate), rather than grouping them into Financials. This change represents the growing importance of REITs to the overall stock market and is likely to result in far more interest from institutional money, thanks to the need to hold prominent REITs as part of increasingly popular index funds. Which means that, going forward, REITs should represent a potentially even more popular and liquid asset class. Note that there is also a separate class of REITs known as mortgage REITs, or mREITs. These are a far more complex, volatile, and challenging class of stocks that are unsuitable for conservative investors seeking steady and growing incomes. That’s because the business model of mREITs is extremely sensitive to interest rate fluctuations (rather than steady contractual rental income). mREITs are based entirely on buying and selling mortgage-backed securities, and involve little or no owned properties. Therefore, they should be owned only by the most risk-tolerant investors, who are willing to put in the extra effort to find only the strongest mREITs, hold throughout periods of falling dividends, extreme volatility, and buy on the corresponding dips, corrections, and crashes. Getting back to traditional property-based REITs, as you can see from the above list there is a vast universe to potentially own, each with its own nuances that investors need keep in mind. However, all REITs share common characteristics in that they derive the majority of their cash flow, which is what secures and grows the dividend, from real estate properties and rental income from tenants. Of course, being that REITs are generally owned as high-yield, dividend growth investments, naturally the dividend profile is the first thing that you’ll want to look at when performing your due diligence before investing. This consists of three factors: yield, dividend safety, and potential long-term growth prospects. The most important of these is dividend safety, because nothing can potentially generate permanent losses of investor capital more than a dividend cut, which generally sends shares crashing. However, because of the way REITs are structured for tax purposes, traditional methods of measuring dividend safety, particularly the EPS payout ratio, are not good means of knowing whether or not a payout is actually safe. That’s because under generally accepted accounting practices (GAAP) a company must include depreciation and amortization of its assets into its earnings calculations. However, the unique nature of real estate assets, particularly that well-maintained properties tend to appreciate in value rather than depreciate over time, means that GAAP earnings don’t actually represent a REIT’s ability to cover its dividend or grow it over time. Instead, investors want to look at a REIT's funds from operations (FFO). This is the REIT equivalent of operating cash flow. FFO adds non-cash expenses, such as depreciation and amortization, back to net income, and subtracts gains or losses on asset sales, such as any properties that management may have sold over a period of time. Even more important is Adjusted Funds From Operations (AFFO). This is similar to free cash flow for a REIT. 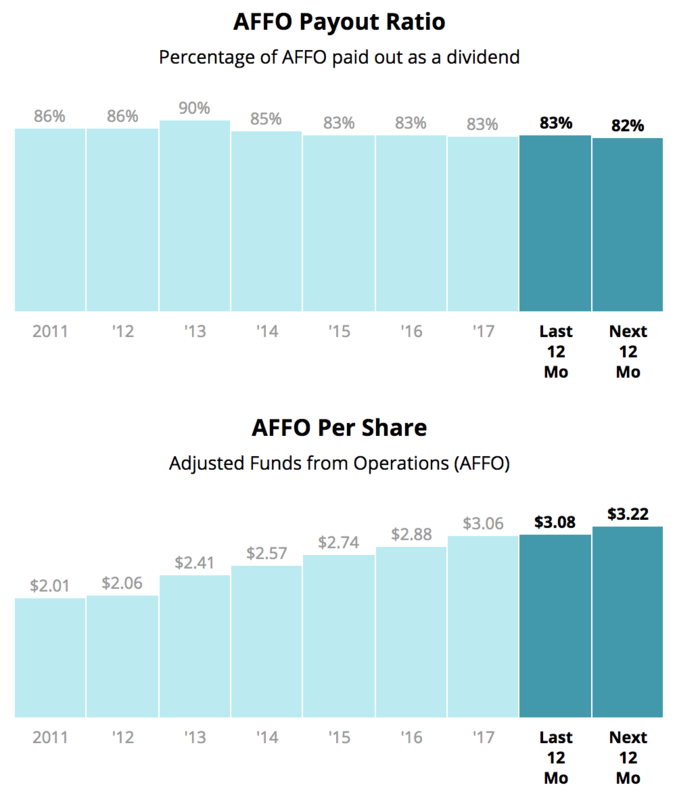 AFFO subtracts maintenance capital expenditures from FFO to show how much cash the company is generating after running its operations and investing enough capital to preserve what it already owns. AFFO can be thought of as “Funds available for distribution” (FAD), and indeed some REITs actually call it that. The difference between AFFO and true free cash flow, as reported by regular corporations, is that free cash flow also includes growth capex, or the money the company is investing to expand its operations. Investors can retrieve these figures from the company they are interested in, and they are also directly available on our website. You can see Realty Income's (O) historical AFFO and AFFO payout ratios below. In addition to the unique non-GAAP figures reported by REITs, investors need to be aware that these companies rely on issuing debt and equity to keep their businesses running. Since REITs are legally only allowed to retain a maximum of 10% of taxable income, they must use debt and sell additional shares to fund acquisitions of new properties or improving existing ones. As a result, the balance sheet of REITs will naturally show higher debt levels than most other sectors of the market. 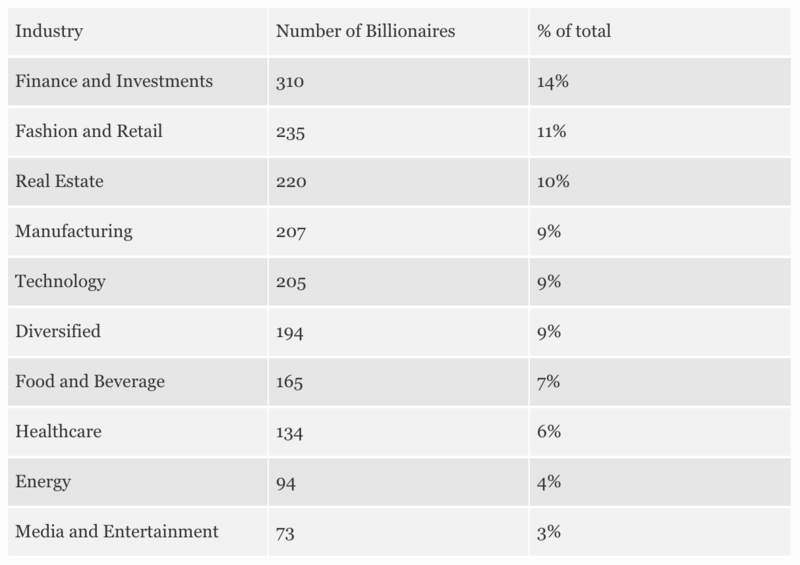 In addition, the share count will tend to rise over time as management sells new shares to fund the company’s growth. For example, Realty Income (O) has seen its diluted shares outstanding more than triple from 80 million shares in 2005 to 274 million shares in 2017. While a rising share count means that existing investors are getting diluted, unlike regular companies, this isn’t necessarily a bad thing. That’s because, as long as the additional money raised by selling new shares or taking on new debt results in AFFO per share growing over time, the capital raise is accretive (value increases). In other words, the increase in AFFO is greater than the rise in share count, resulting in AFFO per share rising over time. That not only makes the existing dividend more secure, but it also allows for dividend growth, which causes the yield to rise, attracting new investors who bid the share price up. In this way, quality REITs can grow over many decades, generating rising income streams and creating substantial shareholder value along the way. There are two other key things to remember about REITs that are slightly different than most other dividend-paying corporations. First, due to how they structured for tax purposes, REIT dividends are unqualified, meaning they are taxed as regular income and thus at your top marginal income tax rate. As a result, REITs are typically great candidates for tax-sheltered accounts such as IRAs. A second important factor is to know whether or not the REIT is internally or externally managed. Most of the bigger, more popular REITs such as Realty Income (O) or Welltower (WELL) are internally managed, and this is generally preferable to an externally managed structure for two reasons. First, externally managed REITs, in which management doesn’t work for the REIT directly but is an external adviser that operates and manages the REIT’s assets, have higher operating costs. Typically the manager charges a fixed fee, a percentage of assets, for its services. There is also a performance incentive based on the growth of net asset value (NAV) above a certain hurdle rate. In other words, externally managed REITs are the real estate version of a private equity firm, and high fees can eat into long-term investor returns. Not only does that lead to higher operating costs, and thus lower profitability, (which can make dividend growth harder), but it can also result in conflicts of interest between shareholders and management. That’s because if management is paid based on the size of a REIT’s assets, then it has an incentive to grow the REIT as large as possible, in order to maximize its own pay. This can result in a REIT chasing after “growth at any price”, meaning buying poorer quality properties at inflated prices, funded by excessive shareholder dilution. You can see this with some of the lower quality REITs in which the share count rises high enough over time to make the NAV per share (the equivalent of tangible book value per share) stagnate or even decline. That being said, some externally managed REITs can make good investments, but you have to be very selective and make sure that management’s interests are aligned with shareholders. Why would anyone take the added risks of owning an externally managed REIT? Well, the best ones are managed by large asset management firms with massive scale, experience, and an army of high quality employees. They are able to make deals that smaller, internally managed REITs might not know about or be able to go after. Regardless of whether an investor is buying shares of a corporation or a REIT, it is important to remain aware of an asset’s sensitivity to the economy. Let’s take a look at how REITs fared during the Great Recession. Many dividend investors are conservative by nature. They aren’t worried about trying to beat the market but are instead focused on generating safe, growing income while preserving their capital. For this reason, they like to focus on companies that have reliably grown their dividends over time. The financial crisis decimated many retirement accounts and was filled with shocks. Many iconic dividend growth stocks proved to be vulnerable. From General Electric to Bank of America, there was no shortage of surprises. During recessions, some businesses perform much worse than others because demand for their products and services is primarily driven by the health of the economy. Unfortunately, many economy-sensitive businesses happen to be major tenants for certain REITs. Real estate took a big hit during the financial crisis, and many REITs were clobbered. However, some performed better than others and nicely preserved investors’ capital while continuing to provide safe dividends. The chart below shows the total return of each REIT group in 2007, 2008, and 2009. REITs with more cyclical tenants, such as hotels, experienced a 22% loss in 2007 and a whopping 60% drawdown in 2008. While they did rebound 67% in 2009, this type of volatility isn’t exactly what every retired income investor dreams of. Mortgage REITs were also walloped with losses in excess of 30% in 2007 and 2008, and industrial and retail REITs weren’t much better. Fortunately, several types of REITs were not as impacted by the recession. Health care REITs were up 2% in 2007 and recorded a more modest loss of 12% in 2008. They also participated in the market’s rebound in 2009 with a 25% return. People continue to need many health care services regardless of how the economy is doing, which can make for more stable occupancy levels and rental rates for these REITs. Self storage REITs lost 25% in 2007 but held their ground very well in 2008 with a 5% return. It is a pain to move things in and out of storage. Items are usually stored for a reason, and storage companies usually have an easier time raising prices on their customers. This, in turn, makes them more reliable businesses with fairly predictable demand. In addition to the drop in many REITs’ stock prices, dividends also proved to be quite vulnerable during the recession. From May 2008 through March 2009, approximately 30% of all REITs suspended, cut, or switched to paying part of their dividend in company stock, according to The Wall Street Journal. REITs’ relatively high payout ratios and dependence on raising equity and debt to fund their business needs got them into trouble during the credit crisis when affordable capital was hard to come by. While no one can predict when the next recession will occur, many investors are feeling cautious about another risk – rising interest rates. A key detail to keep in mind when considering investing in REITs, especially today with global interest rates remain near historic lows, is that REITs can be highly sensitive to changes in interest rates for two primary reasons. First, because of their business model, in which most growth capital comes from raising debt or issuing equity, higher interest rates mean higher borrowing costs. That’s either from taking on new loans, or merely rolling over (i.e. refinancing existing debt). 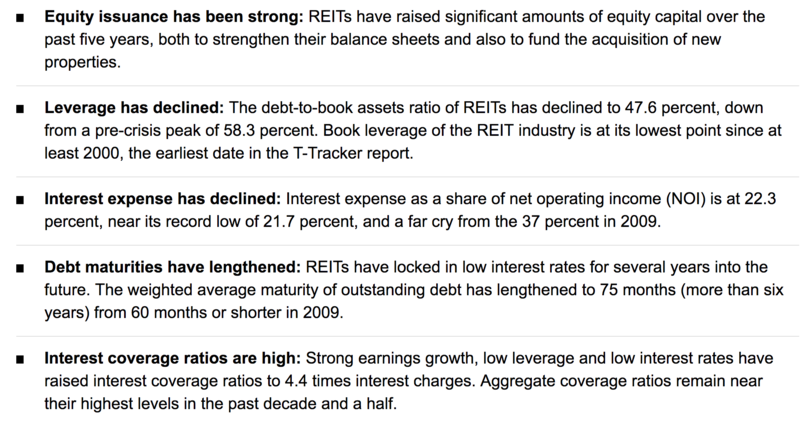 This is why investors need to carefully watch a REIT’s balance sheet over time to make sure its leverage ratios don’t get too high. Typically the best REITs are run by conservative management teams that avoid overextending themselves when it comes to debt. Rising rates can affect property values as well. Fortunately, cap rates (net operating income / the cost of a property) remain well above the 10-year Treasury yield. This healthy spread provides some cushion for commercial real estate prices if interest rates continue rising. However, another reason REITs are interest rate sensitive is because many investors are yield-starved by low bond rates. Thus, REITs, especially blue chip names such as National Retail Properties (NNN) or Ventas (VTR), are seen as safe, higher-yielding bond alternatives. This partially explains why REITs have done so stunningly well over the past decade, as income investors have bid up their prices due to their generous payouts and stellar track record of consistent dividend growth over time. However, the Federal Reserve is attempting to gradually end its ultra-loose monetary policy by raising the short-term Federal Funds rate. While short-term and long-term interest rates aren’t precisely correlated, they generally rise and fall together. Today, many high-quality REITs yield between 4% and 6%. If the risk-free rate of return (i.e. 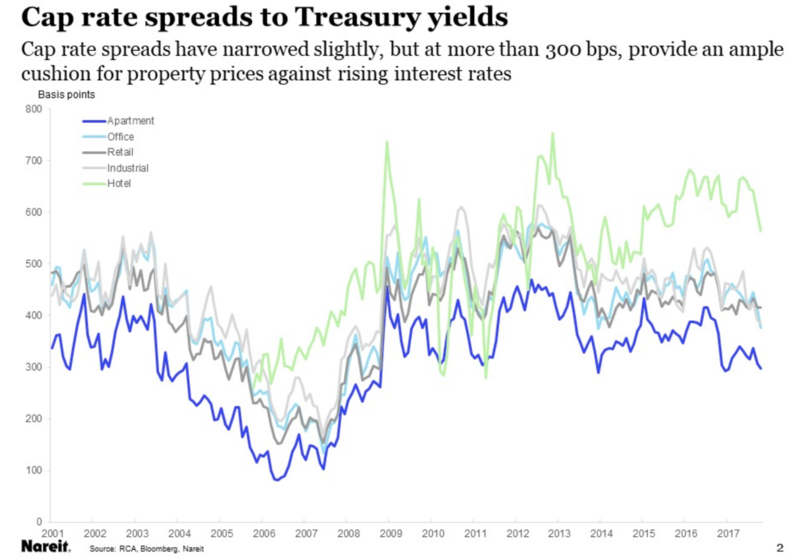 the 10-year Treasury bond yield) rises high enough, then the same group of investors that have piled into REITs over the last few years could reverse course and send share prices much lower. This intuitively makes sense, because any individual stock is naturally much riskier than U.S. Treasuries, even the highest quality REITs. Thus, investors will demand a risk premium in the form of a higher yield to own such stocks, and since yields and share prices are inversely correlated, the rise in yields means a fall in price. Not only does a potentially falling share price represent a risk that investors need to keep in mind (especially if you will need to sell shares to finance medium-term goals such as retirement living expenses), but share prices can have a direct impact on how quickly a REIT can grow. Remember that REITs are periodically raising growth capital by selling new shares. So if the share price falls too low, it can become harder to grow because the cost of that capital might get too high. Think of it this way. If a REIT is currently selling at X and yields 4%, then any new shares it sells also yield 4% and act as a kind of perpetual bond given the ongoing dividend payments required. And that dividend will hopefully rise over time. If the share price then falls to 0.5X, and the yield rises to 8%, then management will need to sell twice as many shares to raise the same amount of funds. This means more dilution to existing investors and a higher future dividend cost for the company. As a result, the AFFO payout ratio will rise, dividend security will fall, and future dividend growth might be harder to come by. In comparison, most corporations, such as Pepsico (PEP) or 3M (MMM), generate sufficient cash flow to fund their growth internally. They only issue more shares in the form of stock-based compensation to employees or to make large acquisitions. But rising interest rates will not spell doom for the industry, far from it. After all, REITs have been around since 1960, and the industry has managed to thrive under interest rates as high as 21%. Indeed, REIT.com noted that REITs outperformed the S&P 500 with a total cumulative return of approximately 80% while the Fed raised rates from 2004-2006. Nareit's John Worth also noted that REITs have recorded positive total returns in 87% of prior periods of rising interest rates, outperforming the S&P 500 in more than half of those times. REIT management teams have had years to prepare for their businesses for the prospect of higher interest rates. As of the fourth quarter of 2017, REITs have clearly taken a number of actions to shore up their balance sheets and lower their exposure to interest rates. Compared to the pre-financial crisis period, they appear to be in great shape. With that said, base rates have never been this low for this long. Unusually strong price volatility could ripple across the REIT sector if the Fed continues raising rates at a brisk pace over the coming years, and investors need to be mentally and financially prepared. Focusing on REITs with experienced management teams, ones that have a proven track record of generating strong shareholder value and rising dividends, is all the more important in higher interest rate environments. Despite their unqualified dividend status and interest rate sensitivity, REITs have proven to be a solid long-term asset class over time. REITs can be especially appealing for investors who seek high current income, dividend growth that can beat inflation, and stocks that provide some unique diversification benefits. However, as with all investments, moderation is key to long-term success. The Real Estate sector only accounts for around 3% of the S&P 500 Index, and REITs possess a number of unique risk factors: interest rate sensitivity (especially given the unprecedented era of low rates we have been living in), a need to access debt and equity markets to raise capital, high payout ratios, unique tax treatment, etc. Therefore, it seems most prudent to limit a portfolio's REIT exposure to no more than 15% to 20% of its overall value. If you are selective in which REITs you invest in, focus on the most important industry-specific metrics such as AFFO, and remain properly diversified, this sector can make a solid addition for many dividend portfolios. Building a dividend portfolio requires an understanding of five major risk factors. Learn how to build a high quality dividend portfolio from scratch.